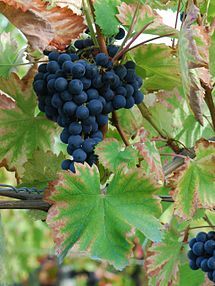 Mourvèdre is a red wine grape variety that is grown in many regions around the world including the Rhône and Provence regions of France, the Valencia and Jumilla denominación de origens of Spain, California and Washington State and the Australian regions of South Australia and New South Wales. In addition to making red varietal wines, Mourvèdre is a prominent component in “GSM” blends where it is blended with Grenache and Syrah. The variety is also used to make rosé and port-style fortified wines. Mourvèdre tends to produce tannic wines that can be high in alcohol. The style of wine produced from the grapes varies greatly according to where it is produced, but according to wine expert Jancis Robinson Mourvèdre wines often have wild game and/or earthy notes to them, with soft red fruit flavors. According to wine expert Oz Clarke, young Mourvèdre can come across as faulted due to the reductive, sulfur notes and “farmyard-y” flavors that some wines can exhibit before those flavors mellow with age. The variety can be a difficult grape to grow, preferring “its face in the hot sun and its feet in the water” meaning that it needs very warm weather, a low leaf-to-fruit ratio but adequate water or irrigation to produce intensely flavored fruit that is not overly jammy or herbaceous. The vines’ susceptibility to many viticultural hazards such as powdery and downy mildew as well as overly vigorous foliage can present additional problems for vine growers.